The Hippy Homemaker is offering three of our readers the opportunity to win ONE OF THREE GIFT CERTIFICATES, a value of $55. One winner will win a $25 gift certificate and two other winners will win a $15 gift certificate to The Hippy Homemaker’s Esty Shop filled with all natural personal care products. I make a lot of my own personal care products. You know, things like shampoo, soap, lotion, salve, scrubs, and deodorant. I’m sort of crunchy like that. Basically, I just like to keep as much “unnatural” stuff off of my body. After all, your skin is your largest organ and whatever you put ON you goes right INTO you. I have been making my own products for over 10 years now. Over time, I have learned a lot about how to make a good homemade product. It takes some trial and error, a lot of research, and the ability to get your kitchen messy over and over again. But it is a lot of fun and I consider it to be a form of meditation for me. Every so often, I will have the opportunity to review another homemade, all natural personal care product. Typically the products are all wonderful but not wonderful enough for me to stop making my own. Christina, The Hippy Homemaker, may quite possibly have just changed that. Christina is one of my esteemed monthly contributors on my blog. Her posts are always amazing, informative, and unique. My readers eat her posts up! For some time, she had mulled over the idea of opening her own Etsy shop. Christina’s blog had a growing following and everyone goes crazy for her DIY recipes! But like most busy mamas out there, it came down to a time versus money situation. Yes, making your own products is cheaper but it does take time. As Christina’s inbox filled with requests for her to open a shop, Christina began to make it a reality. Throughout my first year of blogging, I was consistently asked if I sold the products that I made and wrote about, but I was being extremely stubborn about opening up a shop. I had thought that I my personal mission wasn’t to make and sell products, but to write and teach people how to do it themselves. It turns out, not everyone gets to be at home 24-7 like me, so they just don’t have the time to make EVERYTHING that I do. After a lot of refusal and stubbornness, I finally realized that I wouldn’t be taking away from the people who wanted to make it themselves if I opened my own store. It dawned on me that I would also be helping by offering high quality products without all of the chemicals. People like shopping without having to worry about what ingredients are in their products. I have SO many plans for the future, it’s almost difficult to discuss them all. For the near future, you can expect a full cleansing grains line to be released here very soon. I have been in the lab (my kitchen) creating the best combinations for different face types just so that I can test them out! (That’s my favorite part of this job!) This fall I will be releasing new scents for fall/winter and you can expect a whole plethora of different gift sets for the winter holidays; anything from a beard care kit, to a kid’s set of water color paints and holiday scented play dough. I will also take custom gift set orders for the winter holidays, starting in October. You will be able to customize each item and scent that goes into your gift basket, making it the perfect gift to give anyone! In the summertime I am always smelling like Grapefruit Lavender. I pretty much put it in everything that I put on my body, with the exception of my bedtime butter which is usually vanilla & Lavender (that’s a very comforting scent to me). In the wintertime I am all about the Oranges & Spice! You can imagine that that will be amongst my fall/winter scents! I told you she was cool! Ok, onto my experience with The Hippy Homemaker line of products! Christina sent me three products to put through the wringer try. Per my request, she sent a sample of Peace Pits (deodorant), Gidget’s Ocean Waves Texturizing Hair Spray, and Head Trip (pomade). The Peace Pits and Hair Spray were for me and the Head Trip was for Rasta Daddy to try. First up – Peace Pits! This all-natural aluminum-free deodorant was made with your health in mind. Alzheimer’s AND Breast Cancer have both been linked to aluminum based deodorants, as well as many other medical issues thanks to the pthalates, parabens, and chemical fragrances that most store bought deodorants contain. Peace Pits is FREE of ALL CHEMICALS! 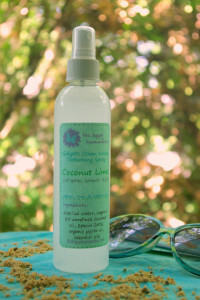 Christina uses all natural organic ingredients to fight the stink that living our daily lives can bring. After trying many recipes, this one was the only one that gave Christina true ALL DAY PROTECTION! And so, she added it to her collection of products. You can choose between these 12 scents including citrus mint, country life, morning fresh, man of the woods, and more! You can also request unscented! I have been using the same recipe for deodorant for years. It works pretty well although I will admit, after a long, hot day in the sun, working up a sweat, I *may* have a little “earthy” smell to me. Nothing that will cause you to fall over, eyes burning, throat closing, but still…enough that I don’t want to sniff my pit. Ha! I decided that I had to really put Christina’s Peace Pits to the test. The day after I received it, I slathered it on and spent 5 HOT hours in the garden. I was sweating to be sure. But at the end of the day when I did the sniff test, I smelled….well….nothing. It was the sweet smell of air to be honest. I no longer smelled the lingering scent from the Peace Pits but I also did not have that earthy odor either. Hmmm…..interesting. I couldn’t claim success with one try so for the next three days I put my pits through their paces. And you know what? Each day ended with the same scent. Nothing. Air. Ahhhhhh!!!! I finally have found a product that I will BUY from someone else. 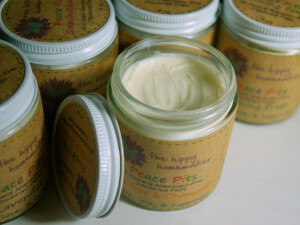 Although our ingredients are very similar, for some reason Peace Pits is a better match for my underarm fragrance. The next product I tried was Gidget’s Ocean Waves Texturizing Spray. I typically just spray my hair with some coconut oil mixed with water it does not always produce that tousled, messed up wavy look that I like. I showered, used my shampoo bar, towel dried my hair, then sprayed the texturizing spray on and scrunched. It smelled great and looked promising. Heh. After my hair dried I discovered I sprayed too much. Oops. After a few more days of experimenting, I found the amount that worked for my level of natural curl and the texture of my hair. This is a great product chalk full of minerals from the pink Himalayan salts, Epsom salts, and dead sea salts. It will actually help aid in hair re-growth because of its mineral content! I highly recommend it…just give it a few tries so you can get your “dosage” ironed out. You can purchase the texturizing spray in 6 fabulous scents or ask Christina to make you a custom scent! The Head Trip experiment was pretty comical. My husband uses a wide variety of products (most natural) depending on the state of his hair at the time. He was a little unsure about the pomade to be honest. He gets settled into a pattern of product usage and kind of hates to mix it up. But in the name of an honest review, he agreed to try it. For wha tever reason, Rasta Daddy allowed our 4 year old to help him put it on. I wish he would have let me take a picture because the result was marvelous! All I can say is that if you need something to hold up a fun Halloween hairstyle, this pomade will do the trick! What I love about this hair pomade is that it will help strengthen and condition your hair while holding the ‘do in place and/or texturizing your style. What my husband loved about the pomade is that it wasn’t sticky, it looked natural, it smelled great, and it did not make his head itch. He was also impressed that it did not leave little white residue flaked behind. So I thing Head Trip was a big WIN! One of the things that will keep me supporting The Hippy Homemaker shop is that Christina cares deeply about the environment. She worked very hard to find the most eco-friendly packaging and shipping supplies. All of her shipping materials are 100% recycled, compostable, and recyclable (including the packing tape!). Christina is also very mindful of the ingredients that she uses to create these natural products. She does not use any chemically created fragrances or preservatives, only pure essential oils to flavor/scent her luscious goodies. All of her products are either made in small batches or made to order so as to keep the longest shelf life of your product. You can also purchase a gift certificate to The Hippy Homemaker Shop or place a custom order! Yay! 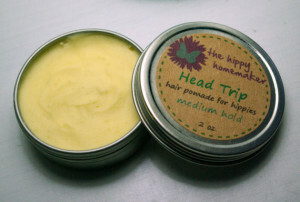 You can purchase your own personal care products at The Hippy Homemaker. Prices range from $3.00 – $35.00. You can also create a gift certificate in any amount. Shipping is through USPS Priority Mail. If you live in the North Dallas, TX area, you can arrange for a pick up. 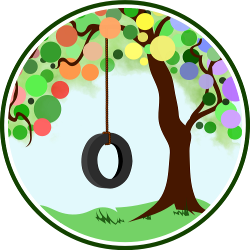 And just for Natural Parents Network and Hybrid Rasta Mama readers, The Hippy Homaker is giving a 20% discount on all orders from now through 2 WEEKS AFTER THE END OF THE GIVEAWAY. Enter code HRMLOVE during the ordering process..
For your own chance to win a gift certificate from The Hippy Homekaer, enter by leaving a comment and using our Rafflecopter system below. Three winners will receive one of the gift certificates (one $25 or one or 2 $15). Contest is open to US/CANADA/. I learned that she has invented a salve for period pain, and I’d love to try it! I will enjoy them–how nice, I usually enter giveaways for stuff for the kids. the products include reiki healing as well! I love that the company is eco friendly, organic and basically “green”!!! Love this giveaway!!! I learned the The Hippy Homemaker has a new fall line of scents coming out. I will enjoy my hippy homemaker goodies! I learned that all of her products are either made in small batches or to order so as to keep the longest shelf life of the product. I’d enjoy using their products!